The Rapid 106 electric staper made in Sweden by Isaberg Rapid is ideal for booklet stapling or for edge stapling. The 106 replaces the popular Rapid 101 model with many improvments. There is a simple drop-down table to enable either edge stapling with an adjustable back stop that triggers the staples or with the table down for saddle/booklet stapling using a foot-switch to activate the staples. There are pull-out arms for accurate registration and a wheel to adjust the stapling power. Two staple sizes are available either 66/6mm or 66/8+ the smaller 66/6 will handle up to approx 20 sheets 80gsm and the larger 66/8+ staples up to approx 50 sheets 80gsm paper. You can view a short video on the Rapid 106 further down this page. The Rapid 106 simply clamps to the edge of a bench, worktop or desk. It can easily be removed when not in use if needed. 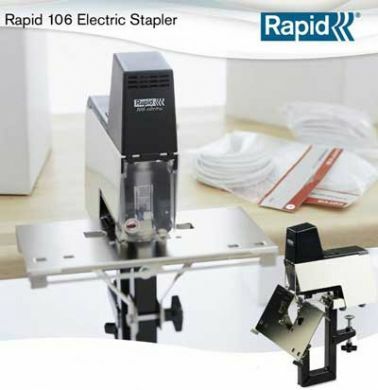 The Rapid 106 electric stapler is popular with copy shops, printers, schools and colleges plus anyone that needs a reliable stapler for both edge stapling and booklet stapling. Flat or saddle (booklet) stapling. Up to 50 sheets 80gsm flat/edge or saddle stapling. Back stop depth is adjustable up to 100mm. Plug-in foot-switch booklet stapling or back stop switch for edge stapling. Optional staple heads to take thicker 44/6 and 44/8+ staples (ideal for harder digital papers or card). Optional staple head to take loop staples. If using hard digital paper or gloss art paper the Rapid 106 has a special optional staple head that takes heavy duty 44/6 or 44/8+ staples. The Rapid 106 can also use loop staples if needed with the optional loop staple head. Ideal if booklets are to be put into ring binders without the need for ugly punched holes.